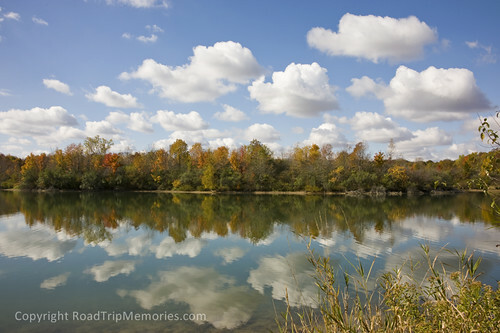 October 2009: Summit Lake State Park – Our first T@B camping trip! It’s been exactly a month since we picked up our T@B from Tiara RV. We “camped out” (i.e., slept in and watched a DVD the first night we brought it home). 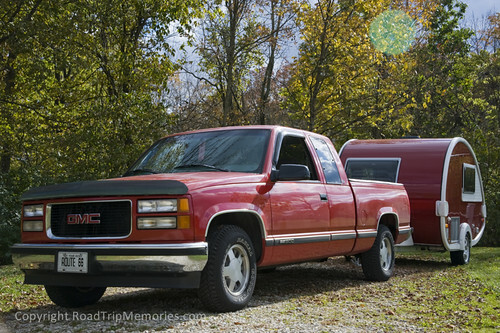 We hadn’t had a chance to really camp in it, since we needed to get a tow vehicle first. Every other weekend I have been busy “fall cleaning” the house. To our delight, several members of the T@B / T@DA Yahoo Group were getting together this weekend. We definitely wanted to go and were excited about it. We made reservations at the campground and toward the end of this week, started getting more items, packing, etc. We took Friday off, and in the morning we registered the T@B with the BMV. Of course, they have a new computer system, basically a “blank slate” and T@B was not in their new system. It took a few calls to the main BMV department but they got us added to their system and registered. *whew* We made a few last stops for needed items, then went home to pack. Tom, the Archwing canopy expert, helped us put it up – big thanks there too. It was our intent to practice putting it up at home, but Pat got sick last weekend, which put the kibosh on those plans. Next, Julia showed up with her white & yellow T@B.
I woke up around 6:00 and went to the nearby facilities. It was very dark and cold, but the weather cleared up and the sky was beautiful with a billion stars! Once we were more awake and coherent, I made breakfast (eggs and turkey sausage), then made some apple crisp for the potluck supper that afternoon. Ella gave us some Amish Friendship bread…it was awesome! Thanks to Ella for that. mmmmm..
We came back to our campsite and Pat put together the new grill we bought, a Safari Chef. It’s a regular grill, nonstick grill, griddle, a wok, or a stove to boil water. The wok is also a cover. Pretty nifty! I made some grilled vegetables, in addition to the apples. 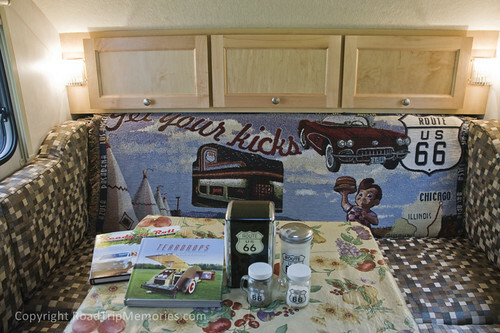 I also played around with our Route 66 throw, draping it over the back of the dinette. We also brought our Route 66 napkin holder, sugar and salt & pepper shakers. We had a very nice get-together…dinner was great! We hung around the campfire for a while, then Pat and I went back to the T@B and played a few games of Yahtzee. We were pretty tired, then went to sleep. So, we walked around the campground trail, but probably took an incorrect fork and ended up walking longer than .9 miles! LOL It was really comfortable out. 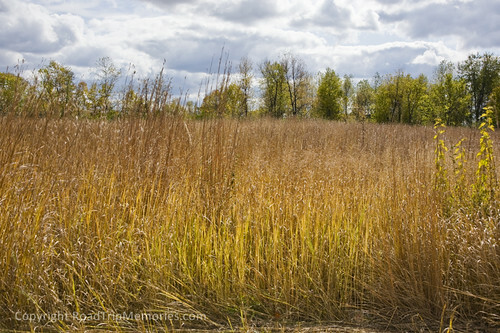 Today was the warmest and most beautiful day…very sunny and a few clouds. Just perfect! We were among the last in the campground to leave, there were only 3 others remaining. It was time for us to break down our campsite, pack up and head home (we didn’t want to! )….but this is only the first of many fun outings for us! Below is a slideshow of all photos from today. We looked into them several years ago, but at the time, weren’t ready to purchase. So we kept taking our road trips and staying in motels as usual. This past weekend, we attended the 2009 Missouri Route 66 Association’s Annual Motor Tour. 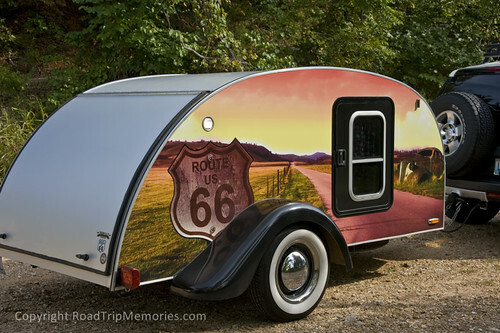 There was a couple on the tour, traveling with a teardrop trailer, decked out in a Route 66-theme. How cool! Not only cool, but for sale too. We were very interested in it, and thought we might catch up with the owners again and talk about it. During the tour, one of the passport stops was at a town festival in Strafford, Missouri. 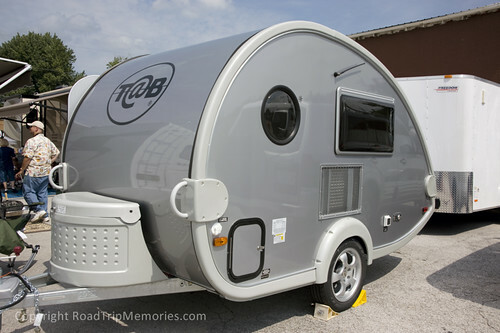 There was an RV display with a full-size RV, a camper, and a teardrop-esque trailer, called T@B. 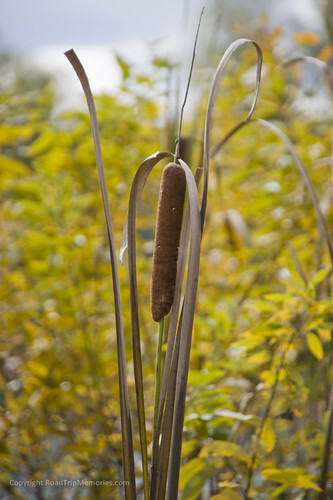 While not a “traditional” teardrop, T@Bs have the same general shape of a teardrop, but taller and longer. It’s exterior dimensions are: height – 7′ 9″, length – 15′ 6″, width – 6′ 7″. It’s interior height is 5′ 9″. This particular model has a toilet compartment inside. Other features common to all T@Bs are a dinette which converts to a bed, interior kitchen with stovetop and sink, and cabinets. 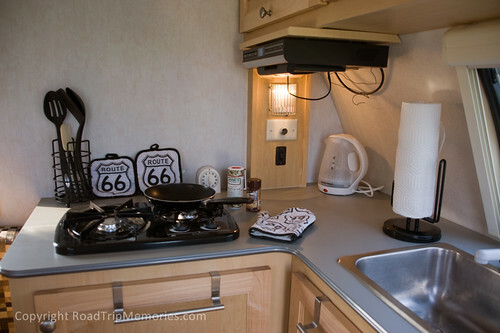 Options include fridge, flip-down TV/DVD, air conditioning / heater, porta-potty, awning, screenroom, and more. Another passport stop was at a Route 66 RV park / motel, and we talked to the owner for a while. He highly recommended Scamp or Casita. 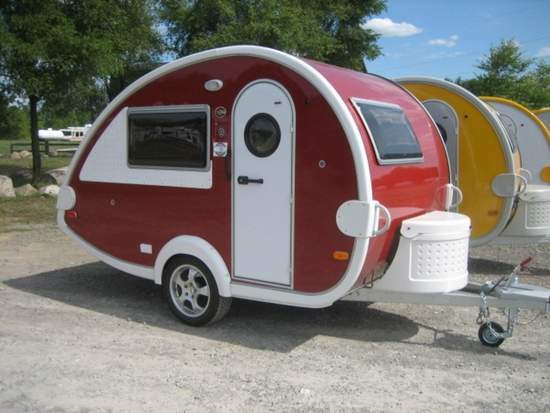 Both fine trailers, but we preferred the teardrop style. 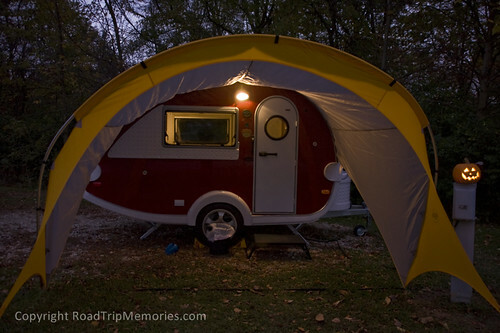 The T@B combined the best of both worlds: teardrop shape, but bigger inside, with a kitchen and seating area. On our ride home, I was searching the internet on my smartphone for trailers, but that was challenging! When we got home Sunday, we started searching…continued Monday night…Tuesday, I found a Yahoo Group for T@B owners. I joined, and started asking questions. Pat found out that Dutchmen was discontinuing manufacture of the T@B, but the enthusiastic and friendly members assured us that purchasing a T@B was a good idea and we would have loads of fun in it. 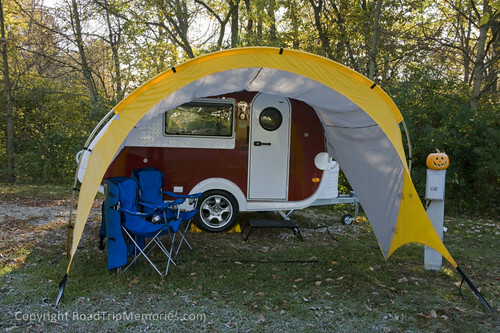 The members are also very knowledgeable and an amazing resource for all aspects of owning a T@B. Pat and I talked alot, asking ourselves if we wanted a traditional teardrop, would we really be comfortable inside it? If it rained as we had to cook in the open galley in back? Not that there’s anything wrong with them…they’re still cute, but the lure of the T@B keep pulling us back. So, we finally forged ahead with wanting a T@B, searching new vs. used. We made a few contacts through Craig’s List, but they were very far away. We ended up finding a dealer with new 2010 T@B models, right here in Indiana! Their prices for new were very reasonable, far below what we had seen elsewhere on the internet for new models from dealers. By Wednesday, Pat and I were so enthralled, and seeing the price for the new T@B, decided to plunge headfirst. We’d been corresponding with Deb at Tiara RV, and so once Pat and I made a definite decision, I called Deb, and the deal was in motion. We made an appointment to pick it up Saturday. Now, here it is, Saturday morning, and we’re getting ready to head out. I slept well last night, but I guess I was so excited, I woke up at 4:00 AM and couldn’t get back to sleep! So, I’ll post more of my own photos later when we get home with our new baby!! 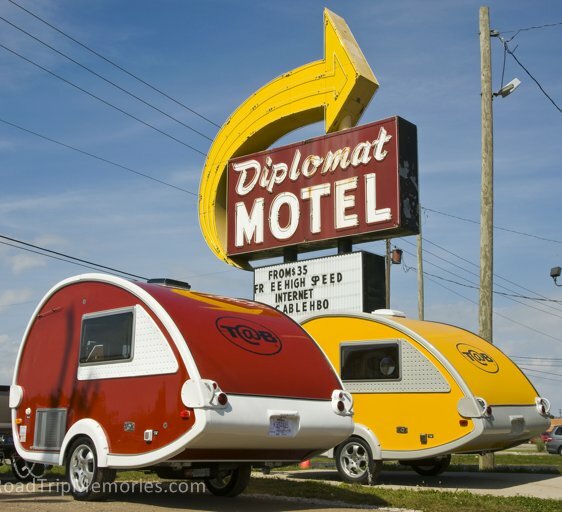 This cool motel sign was in front of the RV dealer. We pulled up with our red T@B and the dealer had a yellow model on display out front. How well they coordinate with the sign!